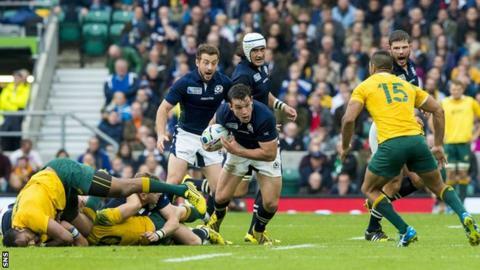 John Hardie believes Scotland should aim high going into next year's Six Nations. The Edinburgh flanker helped the Scots reach the quarter-finals of the recent World Cup in England. "We set our standards high and we know now that we can compete with anyone so we have no excuses [not] to do well in the Six Nations," Hardie, 27, said. "You always aim for the top and we will take each step at a time. There are still good things to come." A controversial late penalty for Australia gave the Wallabies a 35-34 win over Scotland in the last eight of the World Cup. Hardie says the Scotland squad have been given a boost by their performances during the tournament, having lost all their Six Nations matches earlier in the year. "We went in there in the quarter-final with nothing to lose," Hardie told BBC Scotland. "I always thought from when I first got here this team could go a lot further than people thought. It's building and it's just getting better and better. The players are growing and it is still a young side." New Zealand-born Hardie, who qualifies to play for Scotland through his grandmother, agreed a two-year central contract with Pro12 Edinburgh after leaving Super Rugby side Highlanders, although other clubs were looking to sign him up. "I felt it would be awesome to play in Scotland and repay the faith that Scotland gave me," he explained. "I have loved Edinburgh so far. It's been five weeks now and the boys have been awesome. "I would just love to stay and play for Edinburgh and Scotland for these next two years. I hope to play just for as long as the body holds out and it's feeling good just now." Edinburgh are unbeaten in their European Challenge Cup campaign after beating French sides Grenoble and Agen and Hardie expects Saturday's opponents London Irish to be dangerous. "London Irish are coming off a couple of losses so they will be tough as they are a good side," Hardie added. "Then we have them again next week so no doubt they will bring a lot of physicality as they have a lot of good players as they aim to get their season back on track."